I’ve dropped back into Destiny recently. I thought I was out for a while, having pretty much rinsed The Taken King but, much like the way that the only difference between an ex-smoker and a smoker is one stressful day, the only difference between a lapsed Guardian and a fully-paid up Smaug of gun-hording is, well, basically just remembering that Destiny is really fun and loading it up. A few weeks have passed since I indulged that first ‘quick Daily’ while waiting for something to come out of the oven. My Light level has soared, my gear has completely transformed, and I now finally have three entirely different, mathematically tuned armour-sets to custom boost each of my different sub-classes. But you know what I don’t have? Many inspiring new options. Yes, I’ve picked up a couple of decent new Exotics, a better sword, the aforementioned anally-retentive armour balance and a handful of Year Two versions of long-missed old favourites, but it’s been a process of fine-tuning, not overhauling. Destiny is great fun, and it’s more satisfying than ever now that I know that I’m running the most optimised builds for my combination of character class and play-style. But that leads to a slight problem. I’m realising that I’m rapidly running out of road. I’m Doc Brown, speeding along on the time-train, seeing broken track leading to a gaping chasm in front of me, and hoping something cool happens to change my path before I reach the end. Because once I’ve levelled up all of my current gear, I don’t see any new worlds to conquer. You see, in Destiny, when you get to a sufficiently high level of accrual and experience, the (now greatly reduced) grind to upgrade equipment becomes secondary to the theorycraft of actually deciding which bits to put together. Design becomes almost more gratifying than implementation. You find yourself so deep into Destiny’s systems and resonant, meta-game possibilities that the simple chasing of cool new loot becomes little more than a quaint memory. You need the right loot. It has to have a purpose. It has to fit your plans. It has to be an interesting part of a bigger machine, a new engine that powers a coherent element of a refined, well thought-out combat system. It has to be distinct enough to change the ways you can play, either by providing a unique ability that can be buffed and emphasised with other gear, or by radically empowering or recontextualising an existing ability. And I’m running out of ways to do that. And that’s an issue. Because for all that Destiny is very successfully built around long-term investment and months upon months of character progression, it really thrives on its moment-to-moment gameplay. The reason it rapidly became so huge, and maintained its imposing hugeness despite multiple issues in Year One, is simply that whatever wider, structural problems it may have had at any given time, on a second by second basis, Destiny has always been ridiculously good fun to play. It’s a Bungie shooter wrapped up in an MMO. Halo with a long-term, player-centred focus. The studio’s long-held foundations of great gun-feel and immediate, engaging, gratifying combat loops underpin everything that happens in Destiny, whatever your long-term goal is. But if you are going to play Destiny long-term – and doing so is kind of the point – then that core gameplay needs to be incrementally refreshed and updated. And self-made tweaks and new strategic possibilities, by way of hard-mused character builds, are the number one route to making that happen. The brilliant side of this is that investment, research and thought lead to their own, directly playable reward. The downside is that the more enthusiastic you get, the faster you run out of options. Things are good for right now, of course. Hell, my Warlock has hit the point where she’s pretty much broken science, flicking a single-finger salute to the law of energy conservation by becoming a perpetual power generator, every ability recharging every other as long as I play in the right way. With her supers optimised and buffed with tertiary powers, she’s an effortless, walking apocalypse. But that lack of effort is becoming the problem. 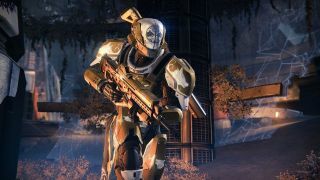 Destiny has done a great job of refocusing itself around breadth of options rather than narrow cul-de-sacs of pure power, but it needs to maintain its progress in that direction. No-one wants a new, Gjallarhorn-style, One True Drop - however much they sometimes think they might in the midst of that fifth Nightfall wipe in a row. That sort of thing only restricts the scope of what should be a game of exploration and experimentation. Conversely, branching combat options will continually multiply the value of any new, more ‘physical’ content - such as environments and enemies - introduced to the game. Making that kind of material is presumably more resource intensive from a developmental point of view, so it makes sense from Bungie’s perspective as well to expand the value of each new addition indirectly, through new ways to interact with it. Let’s face it, we all clamour for new maps, planets, strikes and raids, but the excitement of their arrival is a superficial, fleeting sensation. New starts its swift erosion to old as soon as it’s experienced, and so interest needs to be preserved in other ways. And I’m hitting the point, as I’m sure many players already have, where my attempts to find The New Things are feeling increasingly vain. Everywhere I look, from Tower vendors, to Strike streak rewards, to whatever comes out of my hours spent burning through my always ripe Three of Coins stash, I’m immediately seeing through the Matrix of familiar perks and firing stats, and instinctively junking a whole lot of just-less powerful variations on themes my inventory already has covered. I’m looking for the new Firefly, and the sort of possibilities that opened up with its discovery, when I realised just how insignificant Hive Thrall mobs were about to become. I want the fun of combining Monte Carlo’s instant melee cooldown with my Sunsinger’s Flame Shield to turn myself into a self-buffed Tank unit. But I want new versions of that fun, that do new things. Because ultimately, discovering new things is the fuel that keeps Destiny’s great combat as great as it is. Because the beauty of Destiny, the secret joy at its core, the thing that keeps us playing the same missions, over and over, to the total confoundment of the outsiders looking in and asking ‘if anyone still plays this’, is the fact that it’s always the same, but it’s always completely different. Familiarity is the basis that allows us to experiment and riff with insight and precision. And as such, I’ll happily fight Oryx indefinitely, as long as I can keep smashing him up in new ways that the big, bullying jerk has never seen before. The Rise of Iron expansion has me excited. Very excited. But more than its new maps and storyline, I’m excited about its perks. Give me new guns that do new things, and I’ll play it long after I know its every environmental polygon inside out. But don’t forget those space-dogs either, Bungie. There have to be space-dogs, right?